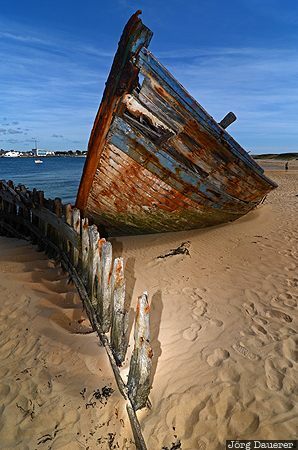 The wreck of an old wooden ship partially illuminated by a flash gun (used as a fill flash) at the banks of the river Étel near the small town Étel below a blue sky. Étel is southern Brittany (Bretagne) in the north-western part of France. This photo was taken in the evening of a sunny day in May of 2011. This photo is part of the exhibition Rust, Wrecks and Ruins (February 2014). This photo was taken with a digital camera.